The first step is to gather all the materials. These materials are a combination of bought an manufactured parts. While Plan B is not expensive for it’s kind, it was not designed to be as cheap as possible. Having said that, Plan B can be built for under €1000,-, making it acceptable. Some parts require special tools. I already have a steady supply of these parts, so I might open up a shop on this domain selling those parts. If you want to 3D print the parts yourself you will also need a 3D printer with a buildbox of at least 120mm x 110mm x 45mm high. For the sheetmetal you will need a flowjet or lasercutter capable of cutting 6mm aluminium. It is probably best to look for a local place to have these manufactured. Most places I got quotes from (both laser and flow) asked around €350. You’d be surprised what you can find if you start looking. These parts (especially the laser cut sheets) will be available in the shop when there is enough interest, but please note that shipping will only be worth it in the EU, shipping internationally would cost a small fortune. The 3D printed parts form the complex pieces of Plan B. It connects the frame to the gantry and makes up most small parts in Plan B. 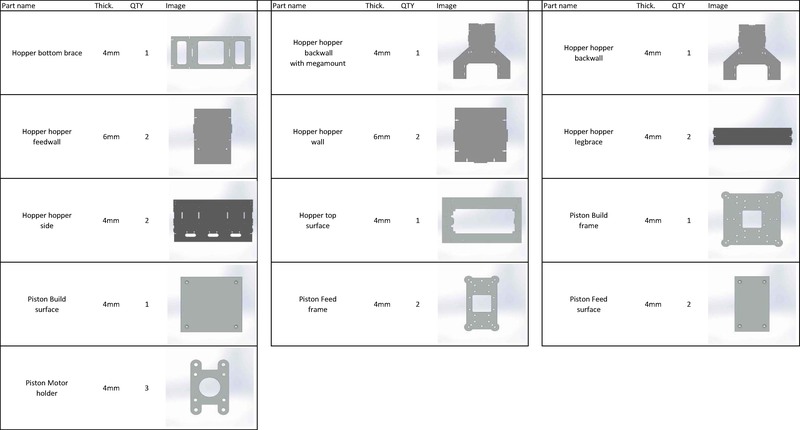 With the STL files you can 3D print all the parts of Plan B. This can be done in any material of choice, but PLA will probably work best since it warps the least. All in all the parts will take around 1kg of plastic on standard density. Minimum buildbox for the parts is 120mmx110mmx45mm, so it should be printable on most printers. The parts have been optimized for FDM printing by having as little overhangs as possible. 3D printing these parts on plan B has not yet been attempted, but it will be in the future. The sheetmetal forms the main body (and most of the weight) of Plan B. While it is technically possible to make Plan B out of plastic, the design was made for aluminium. The pistons need to be made out of aluminium since they have to be heated. All other parts could be made out of plastic sheets, but the would probably need to be thicker, since plastic is a lot weaker than aluminium. The aluminium is too complex to be built by hand. It should be cut on either a high power laser cutter or a water cutter. All the remaining parts have to be bought at a local source. 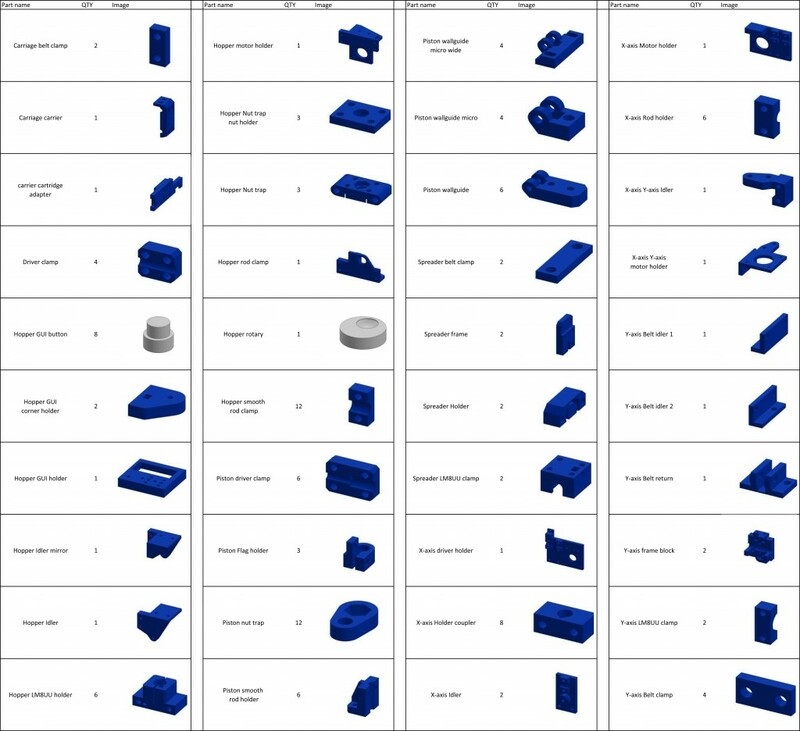 Most of these parts are standard in open source 3D printing and shouldn’t be hard to get. The cartridges can be bought either locally or from ebay, the carriers can be hard to come find, but some printer suppliers have them. The BOM includes a lot of local suppliers, but the most important supplier (Reprapworld.com) can ship worldwide. The 2 double shaft NEMA 17 motors are NOT optional, they are required for the Y axis and S axis, to drive a pulley on both sides. 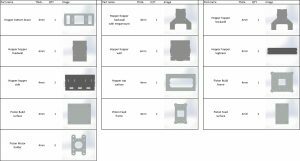 This Bill Of Materials shows everything to build a Plan B. Some circuits can be made by yourself. The list of components for those circuits can be found on the Electronics page.